An interactive map showing the location of bombs dropped on London during World War II has been created. It reveals the devastation caused by the Blitz over eight months. The year-long project, called Bomb Sight, was devised by a team from the University of Portsmouth using data from the National Archives. The website and android app also allow people to find out the types of bombs that fell. Dr Kate Jones, the University of Portsmouth geographer who devised the project, said: “When you look at these maps and see the proliferation of bombs dropped on the capital, it does illustrate the meaning of the word Blitz, which comes from the German meaning lightning. Users can zoom in to specific streets on the map, which uses red symbols to illustrate where each bomb landed. The project was funded by education and research charity Jisc which offers resources and expertise to educational organisations. More than 20,000 people were killed and 1.4m people made homeless during the Blitz, which took place between 7 September 1940 and 11 May 1941. A spokesman from Bomb Sight said the project uses maps of the London bomb census, taken between October 1940 and June 1941. The bombing locations were combined with geo-located photographs from the Imperial War Museum, and memories from the BBC’s WWII People’s War Archive. Jisc programme manage Paola Marchionni said the project was “similar to a map sat-nav”. The website appeared to be experiencing problems due to high volumes of traffic earlier. On 29 December 1940, air raids targeted the City of London, leaving the square mile in flames. Bombs rained down on St Paul’s Cathedral, which Prime Minister Winston Churchill said should be protected at all costs. Volunteer firewatchers patrolled the cathedral’s corridors, using sandbags and water pumps to douse the flames. The cathedral was saved but many more buildings were lost. The Reverend Canon Mark Oakley, treasurer at St Paul’s Cathedral, said although made of stone, the cathedral also had a large amount of timber. He said: “The brave 80 men and women who volunteered to be part of the St Paul’s Watch, after finishing their day’s work, helped save the cathedral from potentially devastating fires. “The cathedral did suffer bomb damage but thankfully managed to remain a focus and encouragement to Londoners in their resistance to fascism. “We must not forget Lieutenant Davies and Sapper Wyllie who removed an 8ft bomb from 27ft in the ground next to the cathedral without being able to defuse it,” he added. “They drove the bomb to Hackney Marshes where it exploded and made a crater 100 feet in diameter. In one of the bombing attacks, Felicity Edwards, who was 17 when the war broke out, was sitting with her mother in the kitchen of their home in Balham, south London, in October 1940 when a bomb fell in the High Road and through the roof of the Underground station on to the Northern Line. More than 60 people were trampled and killed as they tried to escape. 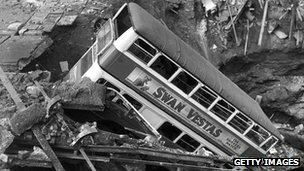 The next day, Felicity saw a double-decker bus stuck in a crater on the High Road. The driver is believed to have driven into it in the dark.